solar jobs report Archives - Solar Love! Home Tags Posts tagged with "solar jobs report"
Solar power critics try to attack it as being too expensive — which is not true — but never mention that there are many new solar jobs created by this emerging industry. Many of these new solar jobs are better than the more general new ones that were added to the national economy. For example, it was also reported recently that 252,000 new jobs were added to the national economy. However, solar jobs typically pay better than the average new job and benefit their local economy. The average annual wage of a solar worker in California is estimated to be over $70,000, according to a separate report. The same report said 15,000 solar jobs were created in the last five years by the solar industry in California. The recent Solar Foundation report noted at the top says that 173,807 people in the US now have jobs related to solar power. “The solar sector has grown an extraordinary 86 percent in the last four years, adding approximately 81,000 jobs. It also shows for the fifth consecutive year, the solar industry is attracting highly-skilled, well-paid professionals. 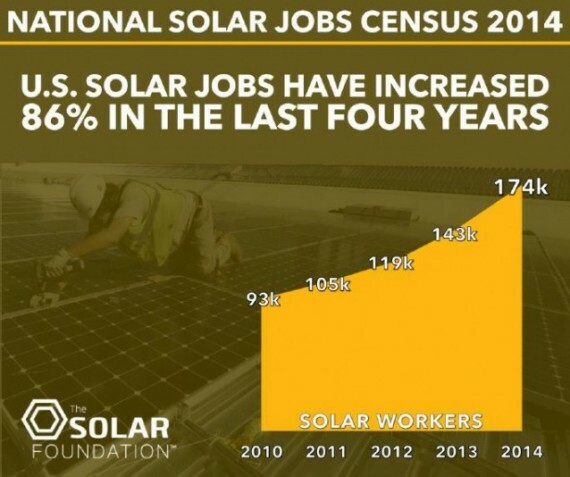 That growth is putting people back to work and strengthening our nation’s economy,” explained Andrea Luecke, President and Executive Director of The Solar Foundation. These facts must get out to the public, so share the news! There are politicians that blindly support fossil fuels and reference the old “jobs vs. the environment” myth to imply that clean energy is bad for the economy. However, we clearly see that in the case of solar power, well-paying, skilled jobs have been added to the national economy. As mentioned before, when states like California invest in solar power new jobs are created, which stimulates the economy. A state like Florida with a local economy that is tied strongly to the construction industry might have fared much better if it had invested much more in solar power. Unemployed construction workers would most likely have been happy to have jobs installing rooftop solar power systems, and they would have been able to make money. Investing in clean energy can be very good for the economy.